If planning on completing a half or full marathon this summer, this program is for you! Great training for; Seattle Rock n’ Roll, Snoqualmie Valley, Vancouver USA or another June/July race! Looking to complete your first race, improve your time or keep your conditioning? These training programs will have you well-trained for your next half or full marathon. Get customized training plans, group training, learn proper hill training and speed work, and get helpful tips and techniques from clinics to help make you the most prepared for your event. Whether this is your first race or you’re trying to qualify for Boston, this is a comprehensive training plan customized for you and your race. Program includes nutritional guidance, cross-training, hill training, pacing and hydration, pre and post-race evaluations, and informative online clinics. Great for first timers or veterans wanting to improve their time, this half marathon program is also customized to you and your race. Focus on distance and endurance, hills and speedwork, cross training and coached weekly group sessions, informative online clinics for half marathons. No races planned but you want to keep your run conditioning going? Looking to maintain your weight? This is a great way to keep your stamina, speed, and endurance with a monthly periodization program. Meet Himanshu Kale – Ironman in Training! Himanshu Kale joined Seattle Athletic Club at the end of July 2012. His goal: to complete a half Iron Man triathlon; his obstacle: he could barely swim! When we met that week for an initial complementary swim assessment, I found he had a lot of anxiety around the water. Like many with water anxieties, Himanshu did not trust that he could put is face and head in the water. However, I soon found that Himanshu had a lot more willingness to work through his fears and anxieties in order to achieve his goals. He was ready and willing to learn the fundamentals first: to start from the most elementary and foundational place: putting his face in the water practicing blowing air out of his body. 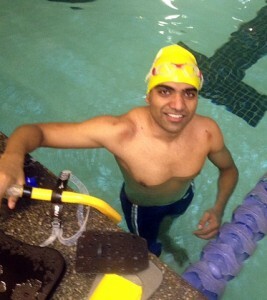 Beginning with learning to breathe properly and gradually adding one technique on at a time, Himanshu has developed a technically strong freestyle stroke. Many people who never learned to swim develop a fear and anxieties around the water simply because they’ve never been in it, making learning more challenging. Others have experienced traumatic events, leaving them with emotional scares of swimming. For all these people, learning to swim is such an act of courage. When they commit to this skill, however, the reward is a life changing shift in their entire perspective of their place in the world. Himanshu took on this challenge. In November he ran his first half marathon. In December he started working out in my Swim Conditioning class and soon joined TN Multi Sports! There he is able to work on his conditioning and prepare for his first triathlons. Now, when Himanshu and I meet, we focus on continuing to improve his technique, learn the other strokes and turns, and continue to work through any lingering fears that come up as we introduce new dimensions to his swimming repertoire. Himanshu’s success is remarkable especially in such a relatively short period of time. I am honored to work with him and look forward to watching him reach his ultimate goal of completing a half Iron Man in June 2012. Working with Himanshu has been an honor, making me especially proud. Sometimes you just need to get a good quick workout in! Practice your form and get your cardio done in 40 minutes! Power Treadmill workout when you’re in a rush but still want to get better! 3 phases each last 10 minutes. You should push yourself just beyond your limit each time. Repeat this workout multiple times increasing your speed and effort so that you constantly improve! You would be amazed at what even 40 minutes can do to benefit you! From 4:00 minutes on, increase your speed gradually so that you finish 1 mile in under 10 min total. Step off the belt and increase your incline to 7%. Increase your speed to 5.5-9.0 mph (gage your fitness level). Push yourself and make sure your strides are long and drive off the balls of your feet! Step off the belt and increase your treadmill to 10% incline. Decrease your speed to 3.6-4.5 (gage your fitness level) and walk on incline for 2 minutes, taking nice long strides. Turn around and back pedal on the treadmill for 1 minute staying on the balls of your feet at a fast walk or light jog. Repeat the walk and back pedal for the next 10 minutes. Walk for 5 min at 0% incline and 3.0-3.5 mph! 5 min rule – if you don’t feel like running, but know you should, tell yourself you will just go out for 5 min. Regardless of how unmotivated you are, go outside and run. If you feel better after 5 min… keep going, if you still feel lousy, head back…you know you tried. The mental block – you are exhausted mentally and physically…or your just not sure how you are feeling… but often, it is just mentally…apply the 5 min rule! Go early… If you are finding the evening runs are challenging…rearrange your schedule and get up earlier… it will relieve that extra stress you always have on yourself by the end of the day. Find a friend… when someone is counting on you… you show up! Set training goals… running a certain numbers of miles each week, time goals, etc. Focus on your long term training goals… (hanging on the fridge)…think about what lies ahead (the race) think about the excitement of race day and all you have accomplished along your journey thus far. Whether you are going after general fitness or you are training hard to prepare for a certain sport, if you train with any purpose, then you are probably training hard. And when you go hard, you are bound to run into a few “wear and tear” problems along the way. These issues do not need to take you off course and should not keep you from reaching your goals! If you have shin splints, you may notice tenderness, soreness or pain along the inner or sometimes outer part of your lower leg and mild swelling. At first, the pain may stop when you stop running or exercising. Eventually, however, the pain may be ongoing. Most common among runners, many times they can also be caused by training too hard, too fast or for too long. Rest. Avoid activities that cause pain, swelling or discomfort, but don’t give up all physical activity. While you’re healing, switch to non weight bearing cardio such as biking, the elliptical, or swimming. Ice the affected area. Apply ice to the affected shin for 15 to 20 minutes after you train. Wear proper shoes. Be sure you are wearing shoes designed for the sport in which you participate. Invest in a pair of shoes that will enhance your performance and protect you from injury. Also consider the age of your shoes. Athletic shoes will last you the equivalent of 350-550 miles of running, depending on your body weight, running style and surfaces on which you train. *It’s also important to resume your usual activities gradually. If your shin isn’t completely healed, returning to your usual activities may only cause continued pain. Choose the right shoes. As previously mentioned, wear footwear that suits your sport and replace them as necessary. Lessen the impact. Cross-train with a sport that places less of an impact on your shins, such as swimming or biking. Start new activities slowly and increase time and intensity gradually. Add strength training to your workout. Try foot strengthening along with calf raises. You can perform this exercise with added resistance by sitting on the floor with your legs straight out in front of you. Loop a wide resistance band around your toes. Flex your toes toward you and extend outwards for 2-3 sets of 10 reps. Leg presses and other exercises for your lower legs can be helpful as well. Seattle Athletic Club Downtown fitness programs incorporate athletic training to build strength, endurance, and agility. Training this way strengthens joints, tendons and connective tissues along with the major muscle groups. Strong muscle attachments and joints that can bear the stress of heavy training are essential in the prevention of injuries. However, even the fittest athlete can encounter wear and tear problems! By taking the right steps, you can minimize the pain and long term effects and get back to your normal routine in no time! Posture: You should run tall and erect, shoulders level, back straight with a neutral pelvis. Forward Lean: Lean forward from your ankles. Many times you will see people running hunched over from their waist or their shoulders (I blame it on computers and being hunched over at a desk all day) this can tighten the chest and restrict breathing. The other extreme is the puffed chest runner I like to call a peacock runner. They literally lead with their chest. Proper form: You want to be tall when you run while leaning from your ankles creating a light forward angle to your body. Helpful hint: think about looking forward about 20-30 feet on the path you are running, this will naturally give your body a slight forward tilt. Looking directly down will make you hunch and looking way up at the horizon can lead to almost a backwards tilt – you want to lean forward in the direction you are going, let the natural forces help you not fight against you. Relax! Relax your shoulders relax your hands! Let your body fall into a natural rhythm. Running tense is wasted energy and as you start to run long you will feel the effects whether you realize it or not. 90degree arms: keep elbows at a 90degree bend. If you are breaking this it means that you are “hammering” with your arm and loosing efficiency. Arm should swing from the shoulder joint not the elbow. Hands should brush by your waist not be tight up by your chest which can cause tiredness and tightness in your shoulders and back. Midfoot strike: (though this one is often up for debate…) Land with your foot striking directly under your center of mass and roll off the ball of your foot. Heel striking often means that you are over striding which affects run efficiency and means you are “braking” causing you to actually run “slower” and may lead to injury because of the impact on your joints. If you are running all on the balls of your feet, your calves can get tight and fatigue quickly and or you can develop shin pain. Run cadence: this is the frequency of your foot strike. Ideally run cad is around 90 (or 180 steps per minute) though many elite runners and triathletes will run at a cadence 100 this is very high for most. Running with shorter strides uses less energy and creates less stress on your muscles and impact to your joints. To count your run cadence, during any portion of your run choose one foot and count how many times it strikes down in a minute. If you are much under 90 this could mean that you are either over-striding and or your foot is spending too much time with impact on the ground (anywhere from 88-90 is great). You want to think light and airy when you run not thumping down heavy footed. Run as if you are running on a hot surface: quick, light and with short strides. NO bouncing! Bouncing = wasted energy and too much impact on your muscles and joints. Next time you put those sneakers on and head out the door for the run think about “how you run” and how you can improve your run efficiency by following the above pointers.